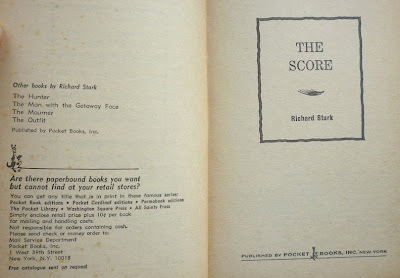 A US first edition/first printing of The Score, Westlake's fifth novel under the Richard Stark alias – and therefore the fifth to star cold-blooded career criminal Parker – published in paperback by Pocket Books in July of 1964. 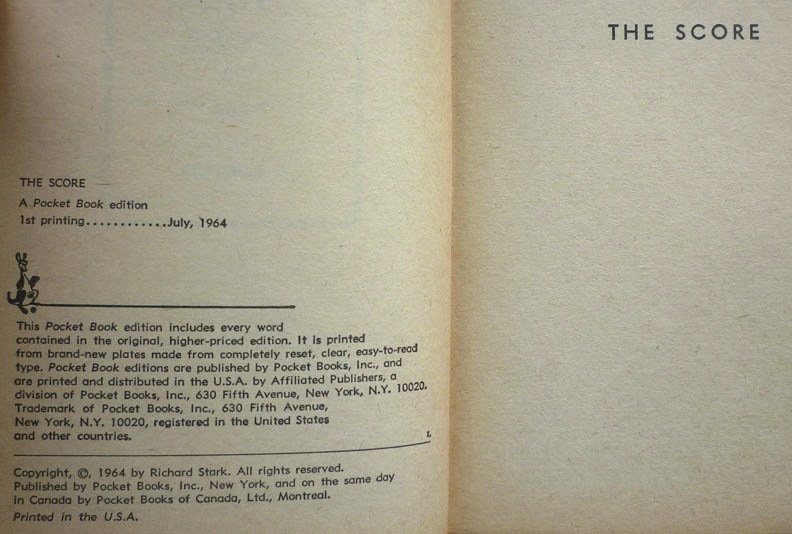 For American collectors this will be an unremarkable item: AbeBooks, for example, lists over thirty copies of this edition from US sellers. But it's rare to come across a copy here in the UK; in the three years I've been collecting Westlake and Parker, I don't think I've ever seen a Pocket printing pop up on eBay, and I've certainly never seen one in a bookshop or at a book fair, even previous London Paperback & Pulp ones. I acquired this copy from one of the dealers at the fair, David Hyman (whose blog can be found here), for a fiver – a very good price which, I feel, helps to abrogate the fact that I already own the novel in four other editions: an Allison & Busby hardback and Coronet, Berkley and Avon paperbacks. 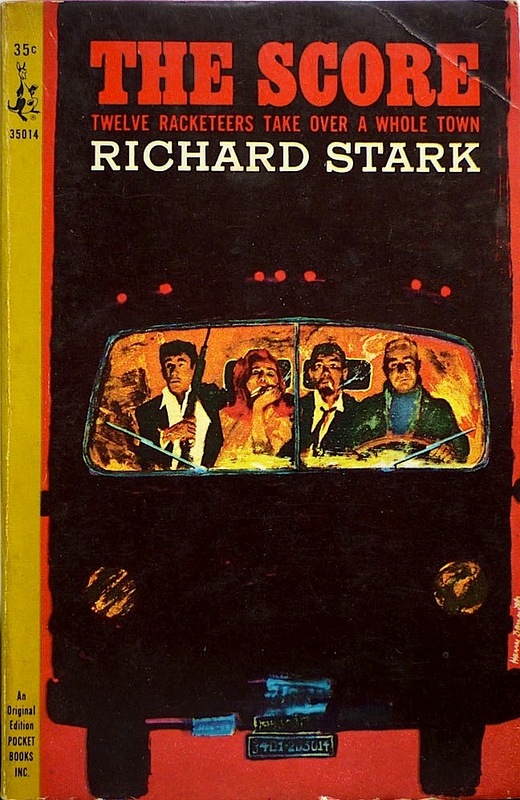 The cover artist is, of course, Harry Bennett, who illustrated the covers of all eight of the Parkers published by Pocket, from The Hunter (1962) to The Handle (1966). I waxed lyrical about Harry's artwork two years ago; that post also boasts comments from Harry's son, Tom, and daughter, Deborah, so it's well worth reading if you haven't already. Much as I admire Harry's work, however, of all his Parker covers, I think The Score is perhaps the one I was least taken with, at least when I wrote that post. 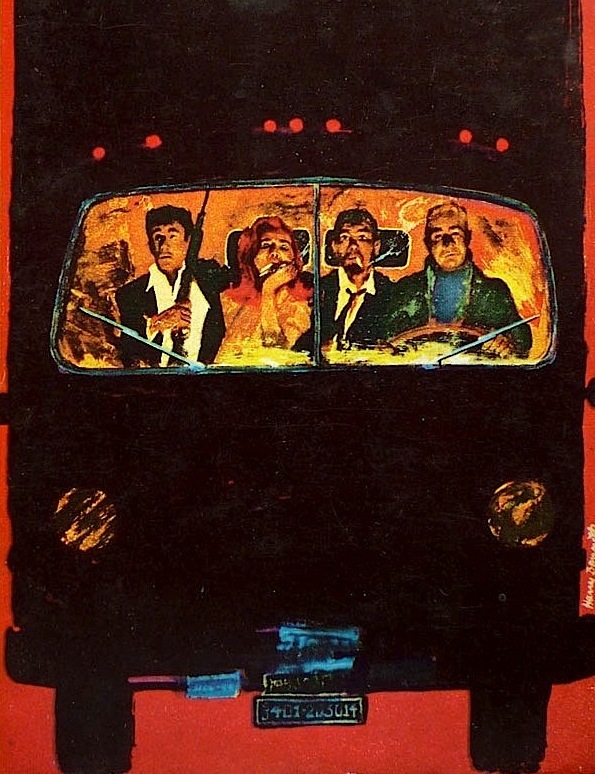 The crew in the cab of the truck – Grofield, Mary, Salsa and Wycza, making their escape from the decimated Copper Canyon – looked too comedic to me, like they belonged in a Dortmunder story rather than a Parker tale. But viewed in the flesh – or, perhaps more accurately, in the pulp – the cover comes into its own. Bennett imbues each face with real character, and I love the little sgraffito touches around the painting – above the truck's numberplate and on the headlamps, and down its right edge. My personal favorite of all the Pocket Book covers for a Parker novel--and I had to have it, albeit a slightly dinged-up copy that I got on the cheap. As you say, not hard to find here in the states. I can never decide if any of the people in the truck is Parker--best as I can recall, he's not driving a truck at any point in the narrative, certainly not with this array of characters sitting in the front seat, but artistic license, of course. He was depicted as a blonde several times on the Pocket covers, but contrary to what some people seem to think, Westlake never once described him as such. He's probably supposed to be Parker, but I will think of him as Dan Wycza, and nobody can stop me. The illustrator depicts Mary Deegan as a redhead, for which he can hardly be blamed, since Westlake didn't get around to telling us she had black hair until "Lemons Never Lie", her second and final appearance in a Stark novel. 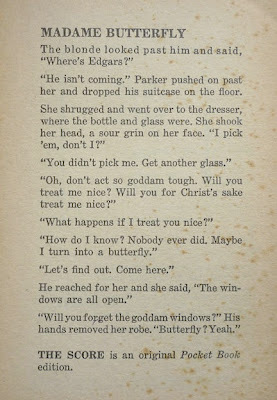 She seems a little blase about what's happening to her, but the illustration does capture some of her calm practical nature, that impressed Parker so much (that he began looking around for a woman who could match it). 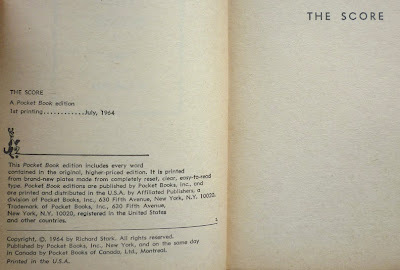 Of the novel itself--what can you say? It succeeds on every possible level you could ask of from a book in this genre, and packs a truly big story into a remarkably small package. No other heist novel OR film OR graphic novel (yes, including that one) comes close. Not every Parker novel qualifies as a small masterpiece, but this one sure as shooting does. If the series had ended right here, Parker would have already earned his place in noir history. Damn, read through your article too quickly--you do, in fact, say the driver on the cover is Wycza. How many Parker covers are there that depict characters from the story, but Parker isn't one of them? A definitive answer to that one will take more time than I have right now, Chris, but off the top of my head, Harry Bennett's cover for The Seventh features two characters from the story, neither of them Parker, and the Allison & Busby edition of Deadly Edge features the two psychos from that story. Btw, who ARE those characters on the Bennett cover to "The Seventh"? Anybody who didn't know the series would assume the fat blonde bespectacled man with a shotgun was Parker, going by the cover blurb. Not one of Pocket Books' finer moments, or Bennett's, though I agree he often did fine work. Parker's associate who had the flu, and his co-ed girlfriend? Best guess I can manage, and it still doesn't remotely depict any scene from the book. McGinnis was leagues ahead here. I assumed it was the nameless thorn in Parker's side – who never gets a physical description, I don't think – and Ellie (pre-sword incident). Bennett's drawing on the back cover depicts most of the rest of the characters. McGinnis's cover for the Gold Medal edition of The Split does depict an actual scene from the story (that sword scene again)... but he has Parker wearing a roll-neck! And much as I love the McGinnis Parker covers, they're so damn literal. At least with Bennett, you have to sit there for a bit try and work out what's going on. Quite a brave thing to do on such an ephemeral format, where the cover was pretty much the only way of hooking the casual reader – which is why there are so many square-jawed men and scantily clad women on Gold Medal and Pocket Books covers. Ellie is clearly described as having black hair, so hard to see how that's her peeking out behind the guy who kills her, unless the printer fouled up, which is certainly possible. 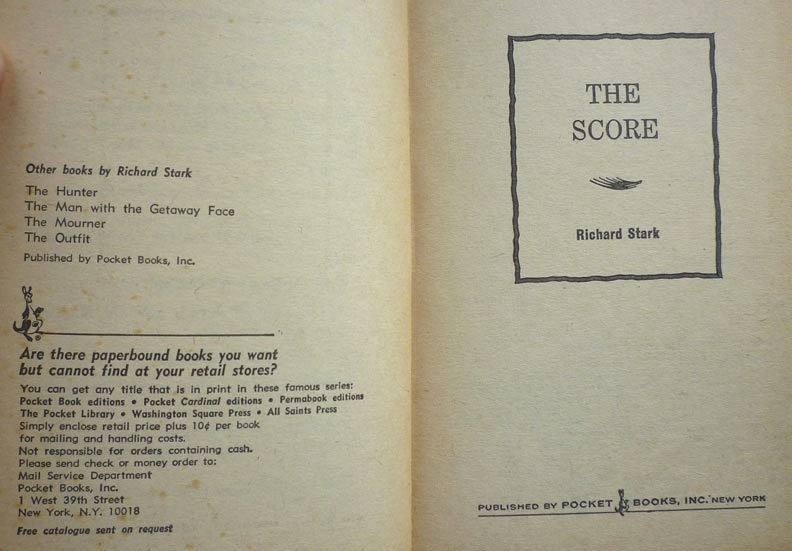 I just don't think Bennett was trying very hard with this one--as opposed to the cover for "The Score", which is so detailed and innovative--the cover for "The Seventh", by comparison, seems schematic and perfunctory, and something of a rush job. Haha, sure, that's true, of all cover artists. But I don't know if that explains Bennett's choices on The Seventh. If it was simply that he was pushed for time, he could have just knocked off a Parker portrait, as he did on The Hunter (and then revisited on The Man with the Getaway Face). Instead, he chooses to illustrate who-the-hell-knows who they are -- maybe Ellie and No-Name, maybe not. Or take The Score. 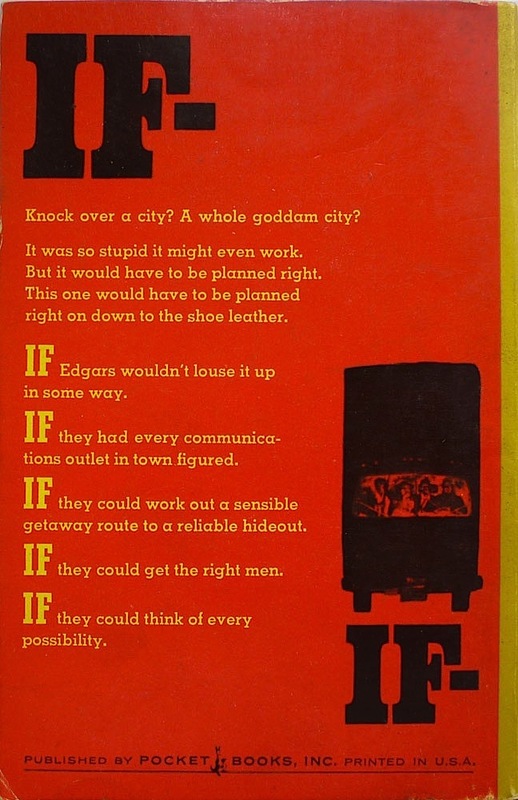 For a novel where Parker and crew take down an entire town, Bennett chooses to illustrate a minor scene from after the robbery, that doesn't even feature Parker! That's a pretty ballsy choice -- willfully obtuse, if not admirably perverse. Interesting take, but I never thought the cover for "The Score" was so counter-intuitive as all that. The book isn't ABOUT Parker, after all--it's very much an ensemble piece, crammed with characters, many of whom never even interact with each other. 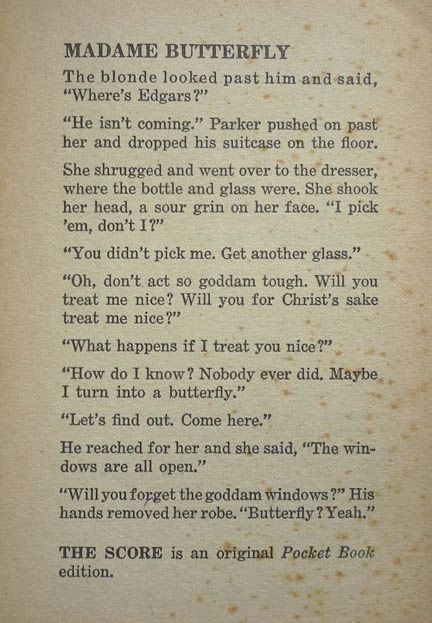 It's actually the first Parker novel that really broadens out the cast of characters, even introducing the other Richard Stark protagonist, and his soon-to-be wife, as well several other characters who would return again and again. A truck filled with a motley assortment of individuals who have been flung together by a bizarre sequence of events is quite fitting to this novel, as I see it. It's certainly MUCH better drawn than the cover for "The Seventh", and depicts an actual scene from the book, as the other cover does not seem to do (which is why neither of us can form any solid opinion on which characters it actually depicts). His cover for "The Man With the Getaway Face" is certainly just as direct, lurid, and shock-oriented as anything from McGinnis. There's no ambiguity there whatsoever--Parker has had plastic surgery, but he's still got those big scary hands, and he's still the same big scary guy you better not cross if you want to live much longer. Looking over your cover gallery for Bennett, I find that his cover for "The Seventh" is the only one I don't like at all, and that it also seems to be the one he took the least time with. Any artist can have an off-day, and I think that's what we're looking at here.